Value of card: Go (expletive) yourself! Key 2006 stat: Bend over, (expletive), and I'll show you! 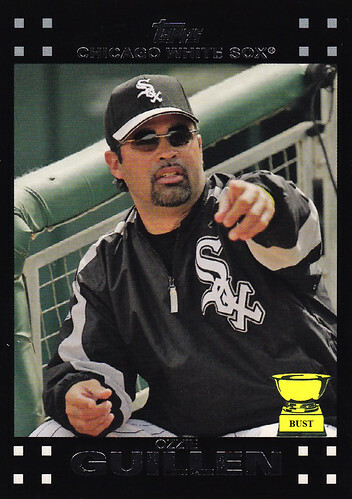 Ozzie Guillen's reaction to The Bust after learning he'd be featured on the site (imagine thick accent): "Excuse me? Excuse me! You talkin' about those (expletive) jokers? Those pieces of (expletive)? No, no, no, no, no, no, no, no, no! That site isn't worth the (expletive) that comes out of my (expletive) after I eat (expletive) Korean (expletive) food out of a (expletive) baby's (expletive)-stained diaper. Look at this (expletive) site. Are you kidding me? Are you (expletive) kidding me? Look at that (expletive) background. Those stupid, soft, untalented, lazy mother(expletives) still haven't updated the site's design? Aren't these wastes of (expletive) space coming up on 900 (expletive), (expletive), (expletive), moronic posts? What a (expletive) joke. I don't want my face on this piece of (expletive). No way. No how. No (expletive) chance in hell. If these (expletive) embarrassments don't have the (expletive) talent or the (expletive) smarts to make their dog(expletive) blog look a bit better after more than two years, (expletive) them and the (expletive) horse they (expletive) rode in on. (Expletive.)"